Representatives of the Board of Management of the Greek Community of Melbourne (GCM) met with cinditates in the 17 March by-elections at the Federal seat of Batman. (1) Support of GCM’s education activities as well as the promotion of Greek teaching in the public schools, considering that Northcote High School, Alphington Grammar and Latrobe University are in her electorate. (2) Support of GCM’s cultural activities i.e. Lonsdale Street Festival, Greek History and Culture Seminars, and the Greek Film Festival. (3) Reviewing the issue of loss of pension when people go overseas, as well as cost of living increases especially for the elder members of our community, considering that a large number of Batman residents are of Greek background and the GCM’s St George church is also in the area. (4) Immigration matters pertaining to recent arrivals from Greece and their special needs. 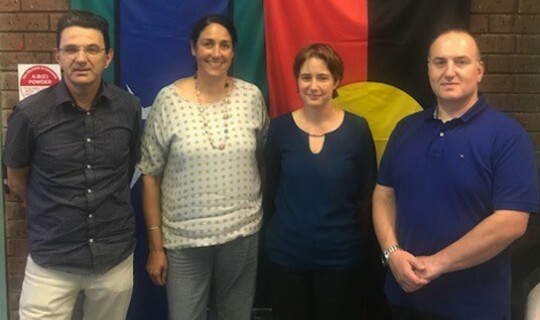 Both canditates stated that they support the GCM and the Greek community and if they are elected in the May 17 by-elections they will dynamically represent Greek-Australians in the Federal Parliament.